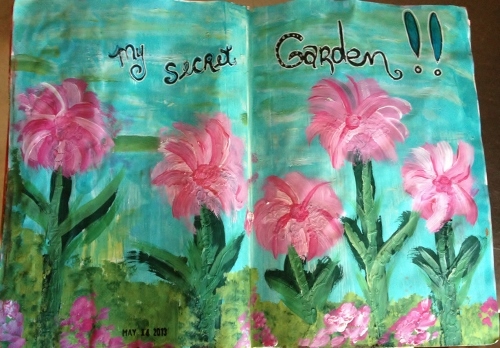 It’s been several days since I began my Art Journal Experience and I look forward to it every time. I thought I’d share some of the things I’ve learned so far. –You can use up a lot of bits and bobs that you’ve been saving. The entry above I finally used the rose in the vase illustration which I had cut out of an old children’s book and had in my stash for at least 5 years. –Don’t put a brad through the previous page without figuring out how you are going to camoflauge the back of it on the next page. Lesson learned. My least favorite part of this page is the metal tape embellishment I put over the back of the brad (upper left corner). –Put masking tape over the center seam of the book before you cover it in gesso so your paints, inks, etc., don’t leak down into the book spine and bleed over into other pages. –Put scrap paper under each page you are working on to keep any overflow mediums from going over the edges onto already done pages or the next page. Some people may not be as picky about this as I have discovered myself to be! This page is pretty much strictly paint and a bit of Lindy’s Stamp Gang mist. I started out wanting to use up some of the scads of leftover alphabet stickers in my stash. You know how when you buy alphabet stickers and use up all the “good” ones and then you’re left with lots of consonants? I’ve created several items in the past using these poor “old maid” letters. If you look closely you’ll see the stickers are the base of the stems, leaves, and flowers on this page. 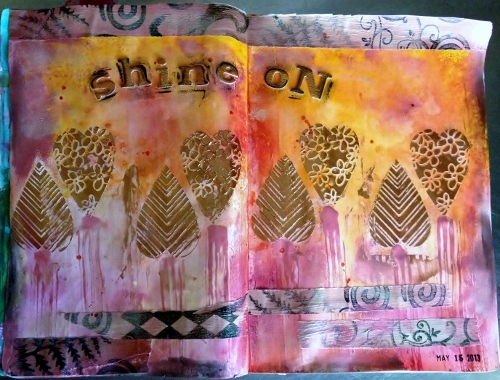 I started out this page wanting to use some InkaGold color pastes. I started with those vibrant Dylusions Spray Inks and then progressed to Luminarte Silks paints, some metallic 3d paints and finally added some painted masking tape I made months ago. On this page I learned that I love all these rich and shiny colors together!! 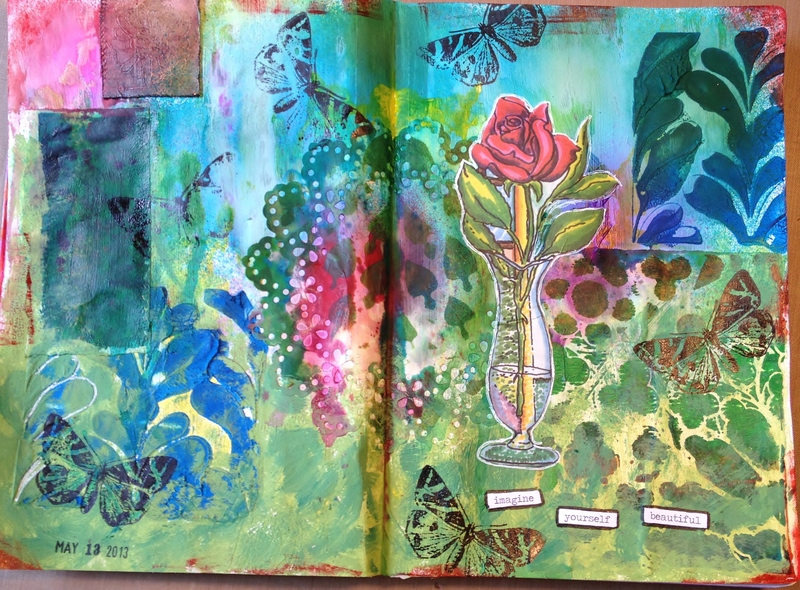 –Roll with whatever you’re doing–there are no rules in your own art journal. Use whatever colors you want and put things anywhere you want. You are the Boss With The Hot Sauce…or the metallic paint as the case may be. –Be patient when it comes to waiting for things to dry. I am completely impatient with this and my heat gun is my best friend. There are some mediums that dry differently if you force dry them and it kills me to have to let them air dry naturally. I will keep working on this. The most important thing as always is…. I love your bright and colourful pages – I learned that you can use leftover alphabet stickers as part of pictures and designs – that is so clever, I wouldn’t have thought of that in a thousand years [which is possibly why I have a drawer full of said left overs!]. Beautiful, beautiful work. Thank you for sharing! Pauline you are awesome to leave such thoughtful comments! Use those old maid letters up!! special has a BIRTHDAY this weekend….. What do you know about that? These are fabulous and fun. My fave is the shine on page. Love how it goes from warm to cool colors and has that hit of black and white. Love the secret garden. Reminds me of my pink David Austin roses that are in bloom. Thank you Marci! Aren’t flowers wonderful?? ?